Abandon hope all ye who enter here! Category C prisoners are kept here (the not so bad ones). Opened in 1809. Designed by Daniel Asher Alexander and constructed originally between 1806 and 1809 by local labour, to hold prisoners of the Napoleonic Wars, it was also used to hold American prisoners from the War of 1812. Although the war ended with the Treaty of Ghent in December 1814, many American prisoners of war still remained in Dartmoor. 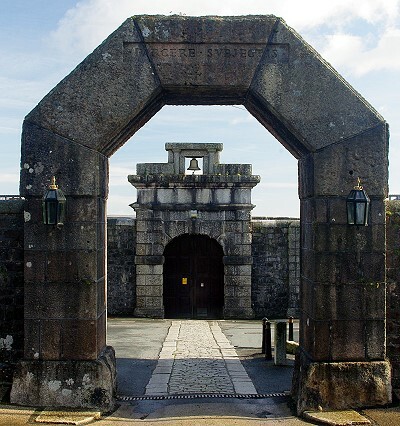 From the spring of 1813 until March of 1815 about 6500 American sailors were imprisoned at Dartmoor. While the British were in charge, the prisoners created their own governance and culture. They had courts which meted out punishments, there was an in-prison market, a theater and a gambling room. Many of the prisoners were black Americans. On April 6, 1815, 7 of them were killed and 31 wounded when guards opened fire at the behest of the allegedly drunk British officer in charge, who thought that they were attempting to escape. A memorial to the 271 POWs (mostly seamen) who are buried in the prison grounds has been erected. Dartmoor Prison was reopened in 1851 as a civilian prison, but was closed again in 1917 to be converted into a Home Office Work Centre for certain conscientious objectors granted release from prison; cells were unlocked, inmates wore their own clothes, and could visit the village in their off-duty time. It was again reopened as a prison in 1920, and then contained some of Britain's most serious offenders.